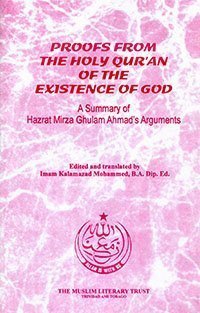 This book proves the existence of God/Allah with 17 undeniable proofs from the writings of Hazrat Mirza Ghulam Ahmad of Qadian. These were collated in The Pocketbook. Once more the Ahmadiyya Muslim Literally Trust of Trinidad and Tobago extends its deepest appreciation to our brother, Yamin Alibaksh for sponsoring the publication of this booklet. May Allah bless and reward him and his loved ones for all times to come. Enayat Mohammed, Chaiman.